Ringer alle fans af verdens yndlingsguiden, denne 2-timers Oxford-vandring tager dig til genkendelige steder i Harry Potter-filmene. 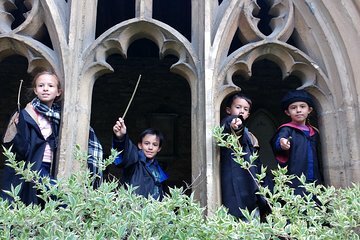 Under denne familievenlige tur vil du udforske de store bygninger i Oxford University, herunder New College og Divinity School - begge fremhævede som Hogwarts School of Witchcraft og Wizardry. Lær af andre litterære legender, der deltog i Oxford University og beundre Bodleian Library, der er hjemsted for mere end 11 millioner bøger. Denne lille gruppe tur er begrænset til 15 Harry Potter fans til at opretholde en intim atmosfære. Hvis du foretrækker at vælge den private rundvisning i New College med bare din fest og guide. Din tur begynder uden for Oxford Visitor Information Center, bekvemt placeret på 15 Broad Street. Hils din guide, hvem skal iføre en Harry Potter-inspireret kappe, 10 minutter før din afgangstid. Som du slentre mod det historiske Oxford University, regner din guide dig med historier om litterære legender, herunder CS Lewis, JRR Tolkein og Lewis Carroll. Opdag insider sladder om Harry Potters stjerner og find ud af hvorfor JK Rowling valgte at sætte filmene i Oxford. Forundre på New College og Divinity School, to steder med Hogwarts School i film franchisen. Se også Bodleian Library, hjemsted for mere end 11 millioner antikke bøger. Efter to timers magisk udforskning slutter din tour ved dit oprindelige afgangssted. Bemærk: New College, Christchurch og Divinity School er lukket for offentligheden på bestemte datoer. Sørg for, at den ønskede tur er tilgængelig, når du bestiller. We went on this tour as part of our Harry Potter trip through out GB and this was truly a highlight with several locations from the film. A great tour! The guide, Peter made the tour interesting as he is very knowledgeable as a scholar of oxford himself. He covered details which we would not have realised ourselves. Would recommend this tour with no doubt. Sharon covered some nice anecdotes about the city as well as having great Harry Potter props and trivia. We didn’t stand too long in one place, didn’t walk long distances between hearing interesting stories, and there were things for the Potter expert (my son) as well as the parent (me). This tour was a wonderful way to get to know Oxford better. We spent a magical afternoon with Peter that both my 17 year old at six year old enjoyed. He was a fount of information on not just Harry Potter and JK Rowling but the wider literary life of Oxford past and present. He built in wonderful breaks and produced treats at all the right places. A must do! Sharon was amazing! Her vast knowledge of the area, the history and many other things we asked about, along with her great sense of humor, made the tour one of our most memorable events of our trip! I can't thank Peter the tour guide enough for such a wonderful walking tour of Oxford. It was both entertaining and informative and a great way to spend an afternoon wandering the streets and learning the history and folklore of Oxford. His knowledge of all things Harry Potter was second to none and it was fantastic to see the various novel and movie references and he also included much commentary on Tolkien, C.S. Lewis and so much more which took the tour to another level. All in all I would highly highly recommend this tour!! This was very interesting and so much fun. Our tour guide had actually been an extra in at least one of the films. He also had met and spoken to one of the main actors later on in Oxford, as her mother lives here and she visits often. He was very accommodating in helping the younger ones get their pictures taken. They also had costumes to wear on the tour if we wanted. Very fun to see the places and hear the true history of the Oxford where the movie took place. Peter was fantastic...I had him all to myself....!!! The tour felt rushed and we were expecting more Harry Potter references.